For information regarding butterflies of the Malay Peninsula and Singapore, the book by Corbet & Pendlebury (revised by Col John Eliot) 4th Edition is still by far the most definitive work to date. Although updated in 1991 by Col Eliot, a large proportion of the information contained in the book dates from the early 60's to 70's which were taken from the 3rd Edition of the book - mostly still relevant. The book, aptly named "Butterflies of the Malay Peninsula" 4th Edition (which we refer to as C&P4) is published by the Malaysian Nature Society and is still in print and available at good nature bookstores. 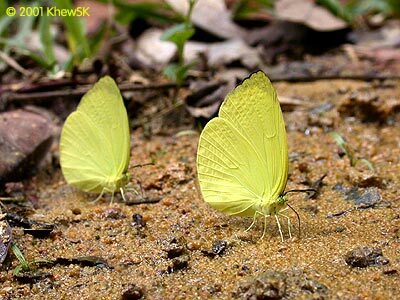 The detailed write ups of many of the butterfly species, as well as overviews of the families, subfamilies, genera and so on, make the information valuable to students and enthusiasts of butterflies in Malaysia and Singapore. The colour plates in the book, taken by renowned photographer and collector, Bernard D'Abrera, add to the informative value of the book. It is assumed that much of the anecdotal information and observations of butterfly behaviour were the result of the personal experiences in the field by the authors and Col Eliot. 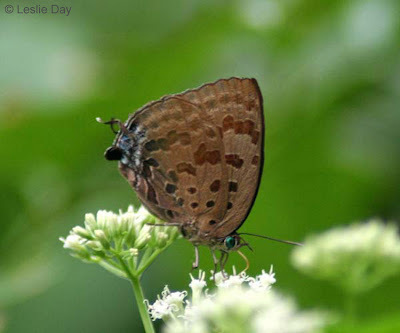 However, some of the observations are of contention today, as members of ButterflyCircle have recorded, time and again, of certain genera and species behaviour. In this short article, we present ButterflyCircle members' field observation findings on two unrelated genera. The first is genus Gandaca. The genus is represented by only 1 species in the region - Gandaca harina distanti or commonly referred to by its English name of Tree Yellow. 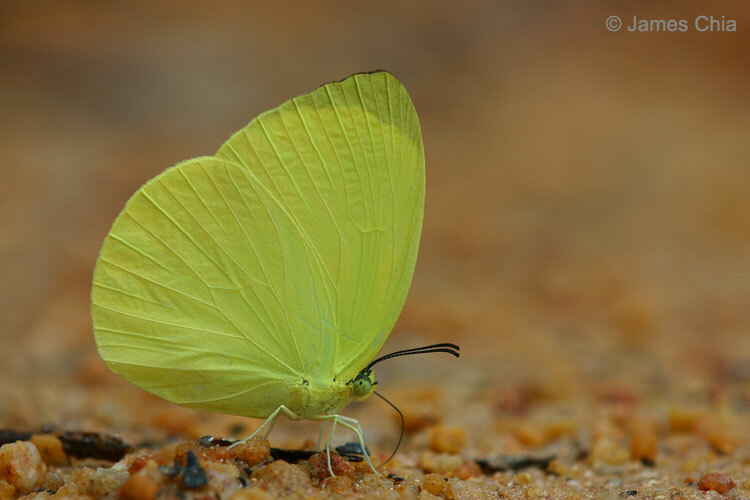 In C&P4, the narrative of Gandaca harina distanti on page 100, reads "Although it is often found in the same localities as the Eurema species, it is a more shade-loving butterfly, and males are never found congregated at moist spots on the roadside or on the banks of streams." Unquote. 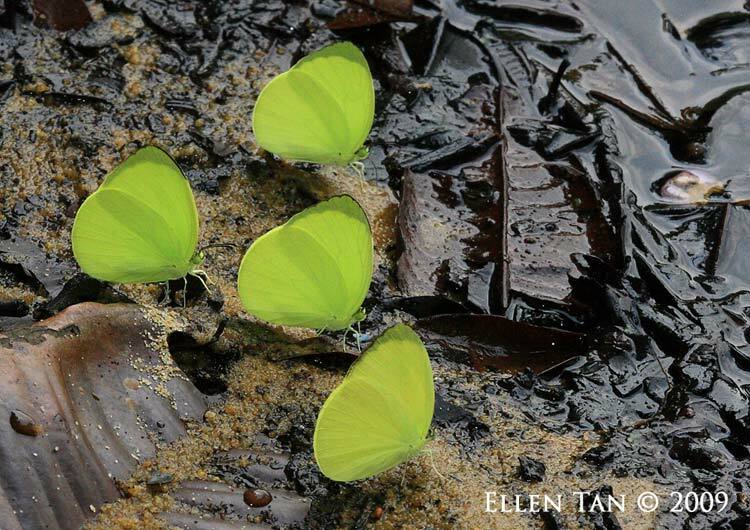 In our experience, this observation is rather curious, as the definitive word never found would suggest that earlier observations by the authors indicate in no uncertain terms, that this species does not engage in puddling activities, either singly or in groups. Our field observations suggest otherwise. Photos by ButterflyCircle members show very clearly that the species does puddle (though only the males do) and on certain occasions, we have encountered up to no fewer than 8 individuals congregated at the banks of a reservoir within the nature reserves of Singapore. The species has also been found in the company of other Pieridae, in particular the Eurema spp. puddling at damp spots along footpaths and banks of streams. We would therefore disagree with the description in C&P4 that the Tree Yellow are "never found congregated at moist spots" i.e. 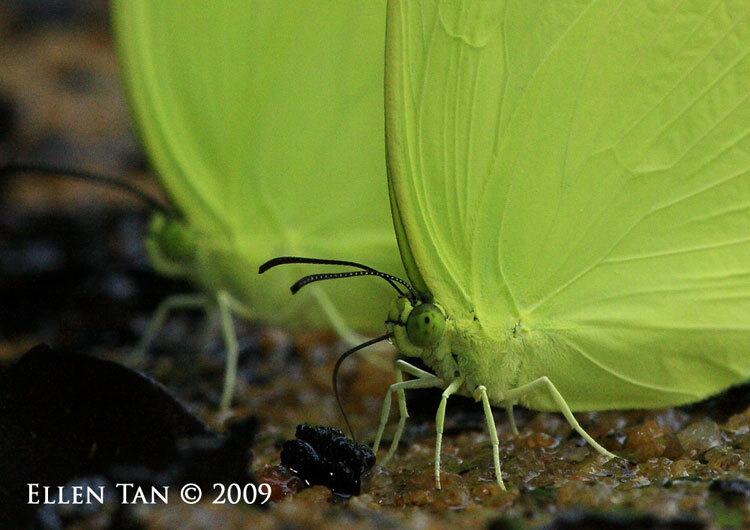 puddling. An Arhopala feeding at the flowers of a Palmae sp. The genus Arhopala features one of the largest number of species of butterflies in the region. Featuring nearly 100 species, the many lookalike species in the genus presents a rather challenging situation for observers and in particular where field shots of species cannot be easily identified with certainty. However, the subject of this blog article is not about the huge diversity of species in the genus. Again in C&P4 on page 268 in the overview description of Arhopala, the early authors made reference to the fact that "They (referring to the Arhopala) are rather unobstrusive in habit, do not visit flowers (nor, indeed, seem to feed at all, despite having a fully developed proboscis), and spend much time settled on the leaves of shrubs and bushes some 4 to 10 feet from the ground, whence they make only occasional short flights". The issue here that we are opening for discussion, is that the authors have indicated, from their own field observations, that Arhopala do not visit flowers. 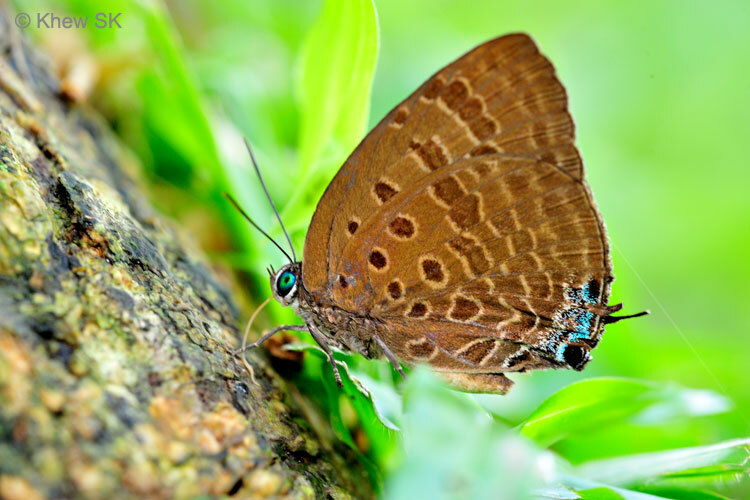 The suggestion that they may not seem to feed at all, though not stated with a definitive certainty, implies that the authors may not have even seen the butterflies feeding, if at all, in their field observations. 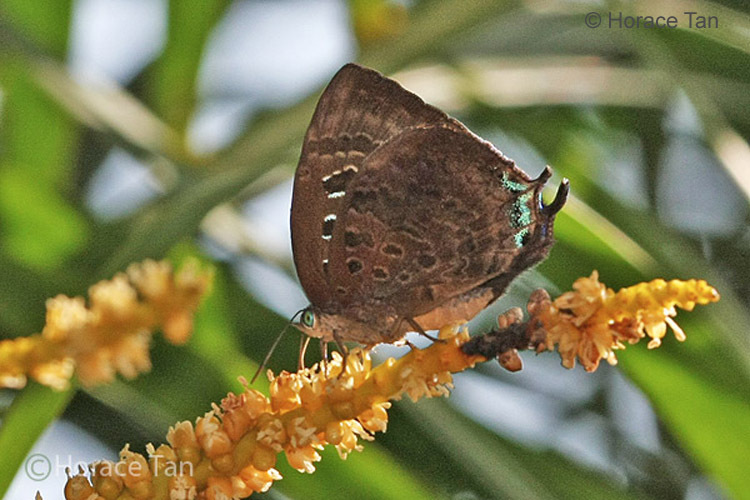 Our own field observations indicated that species of Arhopala do indeed visit flowering plants, particularly those that are favoured by the Lycaenidae (and indeed seen in the company of other species on such flowering plants). 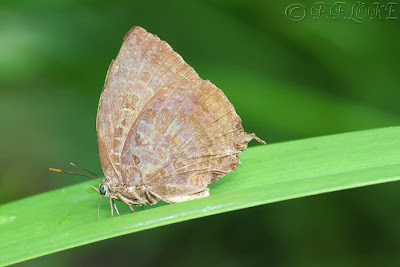 There have also been observations that Arhopala in particular A. centaurus nakula, feeding on the ripened fruits of Melastoma malabathricum as well. There have also been further observations that species of Arhopala appear to be feeding on damp decomposing material e.g. possibly tree sap. 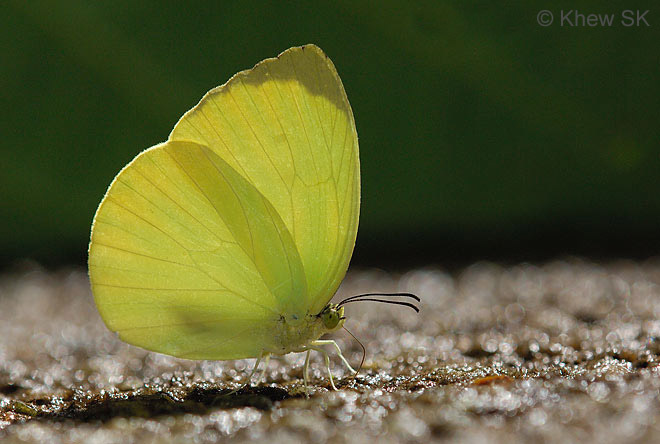 However, the species in this genus are not often observed to feed, behaving as described generally by the authors in C&P4 - where the butterflies prefer to lurk in the shady recesses of heavily forested areas. Even so, we would like to categorically state that from field observations particularly in Singapore (and in one case shown here, an example from Koh Samui in Thailand), that Arhopalas do indeed feed, as well as visit flowers to feed. 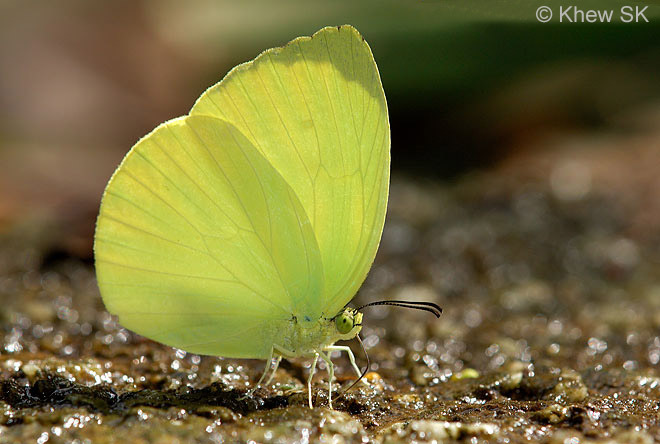 Our own observations, with photographic proof, indicate that the field observations on Gandaca harina and the Arhopala by the early authors, as presented in C&P4, are not necessarily accurate. However, these few isolated inaccuracies do not detract from the fact that C&P4 is still an amazing piece of work done on the butterflies of the region and remains one of the best reference books available to date.